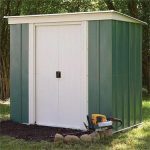 This is one of the more accommodating lean to sheds that we review with its generous depth complemented by a tall eaves height. The result of this is that it becomes more versatile, meaning that you can store tall objects inside, or even keep your bicycles out of the rain and snow. It’s also a very attractive lean to, thanks to the green body which blends in with a garden background, and the cream detailing on the roof and gables. One thing that we particularly liked about this shed is that the roof and hinged door can both be reversed. 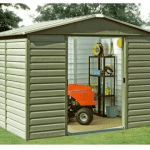 This means that whatever the orientation of your home or garden you can ensure that your shed fits in perfectly. Because of its size and core stability, it can be positioned upon a suitable concrete base to stand alone in the garden, as well as being constructed next to a house wall. With the shelter provided by a wall this shed becomes even more weather resistant, but as it is it’s already rain repellent enough to be given a 20 year anti rust warranty by the manufacturer. 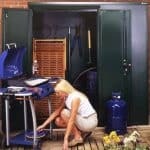 It’s great peace of mind, and can be provided because of the strong galvanised metal cladding used on all the surfaces. 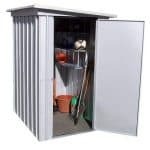 There were two features that made an initial impression on us when reviewing this metal lean to shed. The first was the attractive colour scheme, making it suitable to be housed in a traditionally themed garden. The same dark green colour was used inside and out, which was a good indication of the quality and attention to detail that we found in the shed as a whole, and it seemed well executed and scratch resistant. The other thing we noticed immediately was its size, as its much deeper and taller than many lean to sheds that we review. At its peak, the pitched roof is 2.03m and this is accompanied by an eaves height of 1.78m. The external width of the shed is 1.44m, and the external depth is 2.33m, meaning that your concrete base must be at least that size. This shed features some of the lightest and thinnest cladding that we’ve seen on a metal shed, and yet we needn’t have been concerned. Once constructed, the shed felt surprisingly solid and stable. There are two reasons for this, one is the thicker galvanised frame upon which the cladding fits, and the other is the hot dipped galvanisation itself. All cladding, including the roof and gable, is subjected to it, and it makes the metal strong and resilient. In fact, the finished result is so tough that shelving, available as an optional extra in either corner or rear varieties, can be screwed directly onto it. We were a little disappointed that the anchor kit isn’t included as standard, as being lightweight the shed will need anchoring down to a suitably sized area of level concrete. The kit itself, consisting of Hilti screws and a special drill bit, is relatively inexpensive but many manufacturers supply these items as standard. 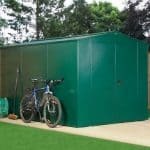 We were very pleased to see that Shed Baron provide a 20 year warranty with this shed, as it’s twice as long as those provided with many metal sheds we review. It covers the shed against the occurrence of perforations that are caused by rust, and the lengthy warranty period shows just how effective the combination of a pitched roof and galvanised cladding is at keeping water out of the shed. There are, of course, no treatments required, which saves both time and money when compared to the annual treatments that are necessary for most timber sheds. One of the great things about the single hinged door, just like the roof itself, is that its orientation can be reversed to make the most of available space. We were also impressed by how strong it felt during opening and shutting. 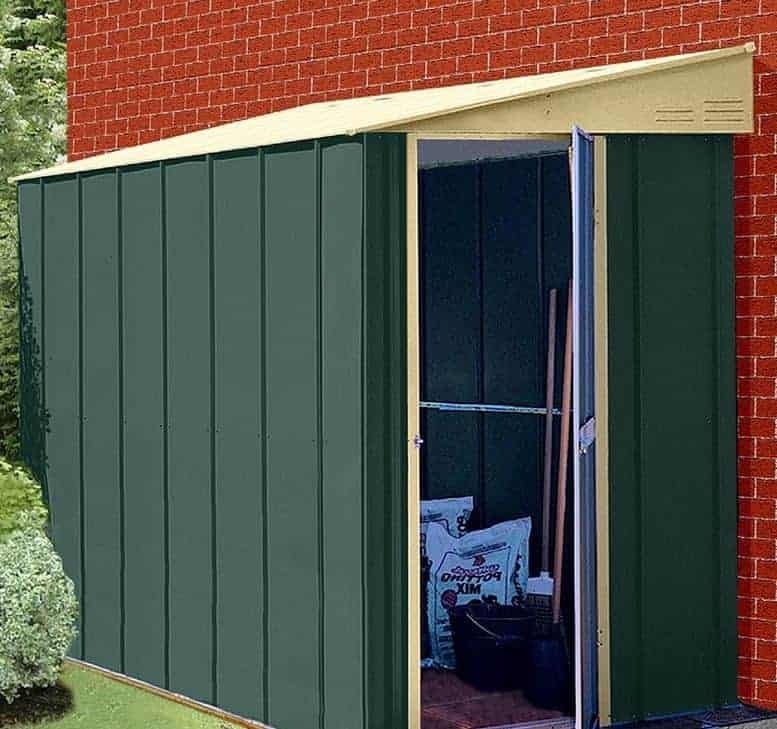 At 1.73m high and 0.63m wide, it’s also well proportioned so taller owners won’t have to stoop down every time they want to get into their shed. 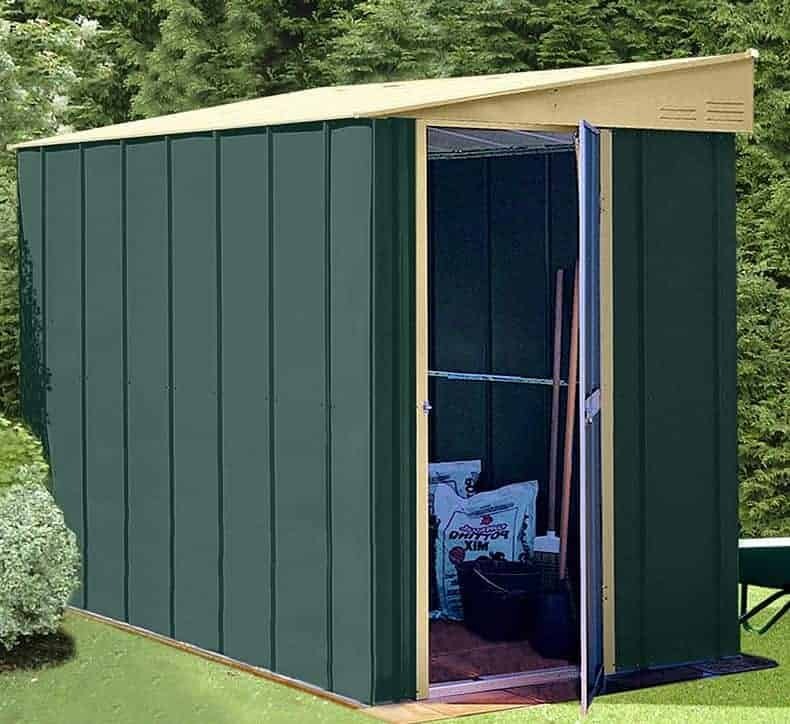 There is no window on this shed, and the dark green paintwork of the interior can make it seem dark and gloomy, so you may want to have an artificial light source installed. Alternatively, you can take advantage of the skylight or sliding window that are available as customisation features. The lack of windows, far from being a disadvantage, can even be a positive security feature, as it stops people from being able to see whatever is kept inside. For that reason, it’s something we welcome. We were also pleased that the door handles have been holed so that they can easily accept a padlock, although we would have liked to see one included with the shed. For ease of use and to speed up the installation process, we recommend affixing this shed to a pre-existing concrete base. If you prefer the traditional charm and warmth of a wooden shed, however, you can purchase a timber floor support kit. 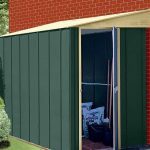 It allows you to lay suitable timber or decking boards down, but you will need to purchase these separately and it also makes sense to fit a damp proof membrane first. If you need to construct a flat concrete base, there’s also the option to buy a steel foundation kit which makes it easy to create a base with the correct dimensions. Some people prefer to have natural light in their shed, which is why we were pleased to see that both a skylight and a sliding window are available to purchase as extra features. Both are made with styrene glazing, which although clear is tougher than normal glass and doesn’t shatter upon accidental impact. For a relatively low price lean to, it was good to see that no compromise had been made on quality. We found the cladding as a whole well machined, and the paintwork even applied throughout. Thicker cladding may have made this shed even more durable, but even so it’s backed by a very welcome 20 year warranty against rust perforations. The tall headroom, thanks to the ridge and eaves height, creates much more storage space than you might originally think. As with most metal sheds we review, there were lots of small components, many of which look similar. We would recommend, therefore, reading the instructions carefully and sorting the parts out before beginning the assembly. Two of us took just over four hours to install this shed. With such a good storage area allied to a 20 year warranty, this represents good value for money, but adding a flooring kit can significantly increase the initial price. 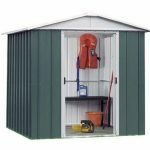 Final Thoughts: We found a lot to like about this lean to, which is why it should be high on the list of anyone considering this very useful style of garden shed. Lean tos are renowned for their excellent weather protection, as this is often enhanced by the shelter offered by an adjacent wall. This shed, however, has excellent waterproofing as standard thanks to the galvanised cladding used on the walls and the pitched roof. With the roof and door both being reversible, this can fit practically anywhere, and its attractive paintwork means that it won’t look out of place in any environment.